When trumpeter-composer-arranger-bandleader Don Ellis and his 21-piece assault force stepped on stage at the '65 Monterey Jazz Festival, they dragged the big band format into the modern era. The golden age of big bands, roughly framed by World War II, was well over. Duke Ellington and Count Basie, though active, were simply refining a style perfected years before. Young Turks like Buddy Rich and Maynard Ferguson, with whom Ellis apprenticed, reinvigorated the format but did not reinvent it. Their modernized spin on big band jazz will forever be defined, sadly, by the unmistakably slick, processed delivery of Johnny Carson's Tonight Show orchestra. Outside the walls there was a musical revolution going on; Ellis and crew were first to hit the street and help storm the barricades. Electric Bath, recorded in 1967, showcased a relentless creativity which, when combined with precision playing and unbelievable energy levels, delivered something totally new - and wild. The Ellis Orchestra fused rock with jazz, boasted truly bizarre and technically dazzling time signatures, introduced exotic musical influences that added an otherworldly quality, and played with joyful exuberance. Ellis could show off with the best of them, using a four-valve trumpet to split notes into quartertones, bending and teasing with the panache of a rock guitarist. The Don Ellis Orchestra was masterful at making the most of dynamics; they went from poignant, soft, and gentle to hurricane velocity with effortless ease. As a bandleader, Ellis was exacting, he had to be, when you've got 21 guys playing in 19/4 time there's little margin for error. In this regard, Ellis was a marvelous anomaly; he combined the fearless experimentation of the late 60's with a rigorous discipline conspicuously absent from most of what was in the air back then. 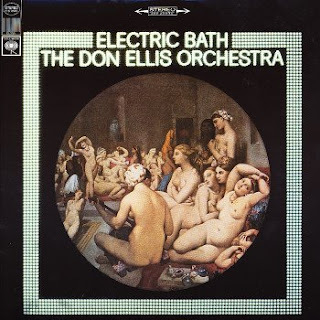 Discovering a more scintillating, groundbreaking CD than Electric Bath by The Don Ellis Orchestra is certainly possible, but far from easy. It is perhaps a notch below Tears Of Joy, the DEO 2-CD masterwork. But comparing the two is rather like asking which is the better Vermeer, View Of Delft or Girl With A Pearl Earring? Once you've hit that level of quality, who cares? Electric Bath, which was nominated for a Grammy award and also earned an "Album of the Year" award from Down Beat magazine, quickly became Ellis's most popular release to date. The recording was Ellis's first studio album with his orchestra and also his first on the Columbia label. The 5/4 "Indian Lady," from the Electric Bath session, features passages of Indian-inspired textures and became a fan favorite. A shortened version was released as a single. Another selection on the recording, titled "Open Beauty," features psychedelic webs of electronic effects, including creative trumpet improvisation by Ellis utilizing an echoplex tape-loop. The studio environment of Electric Bath provided Ellis the ability to control every aspect of the recording. This control resulted in a more sophisticated production and tighter performances than that of his first two live recordings. Regarding Electric Bath, Henry Mancini commented, "My rock-oriented teenage son, Chris, and I have both flipped out over Don Ellis's new band. Anyone who can reach these two opposite poles at once must be reckoned with and listened to." "Conceive, if you can, an aural collage created by the Beatles, Karlheinz Stockhausen, Ravi Shankar and Leonard Feather's Encyclopedia of Jazz. And then, imagine that creation churning through the high-powered talents of twenty-one young musicians, like a rumble before you open the door of a blast furnace. Electric Bath runs this scope of ideas and intensity [ . . . ] Don's use of a funky 7/4 or a blues in 5 gives us a delightfully renewed sense of tension in rhythm. New tempos change our awareness of accents, break down the cliché phrases based on 2/4 or 4/4, and [ . . . ] make us listen in very real natural extensions of a modern musical conception. The Don Ellis Band has no academic hang-ups about its music – it just radiates good vibrations in a refreshing contemporary idiom."